Best friends Karen Wright and Martha Dobie are headmistresses at a successful private school for girls in New England. Mary Tilford, a spiteful, angry child, is caught in a lie and punished. In retaliation she tells her grandmother, a matriarch in the town, that Martha was “jealous” of Karen’s relationship with Dr. Joe Cardin, and tells her that Martha’s Aunt Lily thought those feelings were “unnatural”. Grandma believes her and pulls Mary out of school. The word quickly spreads and within days Karen and Martha are faced with empty classrooms. Joe is fired from the hospital for siding with the teachers. Karen and Martha sue for slander in a case that makes national headlines with terrible ramifications and consequences. "Vindictive Schoolgirl attacks teachers' reputation"
Since Lillian Hellman's play the Children's Hour first appeared on Broadway in 1934, we have become accustomed to its subject, Lesbianism. Yet the idea of a wicked 14-year-old girl spreading lies about her teachers still shocks. That girl is Mary a pupil at a New England boarding school for girls whose accusation of an unnatural relationship between the school's founders is backed by her grandmother (Sandra Thomas) turned out in some outstanding costumes. You feel sympathy with the teachers and tainted by Mary's cold-blooded cruelty just to avenge the punishment she is given for a minor offence. Aged only 16 and a member of the Garrick Academy of Performing Arts, Erika Pickard plays the role of Mary, the vindictive adolescent. This apparently sweet slip of a girl turns out to be a bullying, blackmailing, lying monster. Erika's performance marks her out for a bright future on the stage. Lisa Wood as Karen and Ali Davenport as Martha portray eloquently the teachers' lasting friendship through the thick and thin of losing both vocation and reputation but, towards the end, it dawns on us that one of them is, if only in her head, guilty of the love which, in those days, dare not speak its name. There are 13 actors in this moving play. All of them are good and speak with unswerving New England accents. The heartbreaking conclusion underlines the truth of Shakespeare's famous line "Oh what a tangled web we weave when first we practice to deceive." 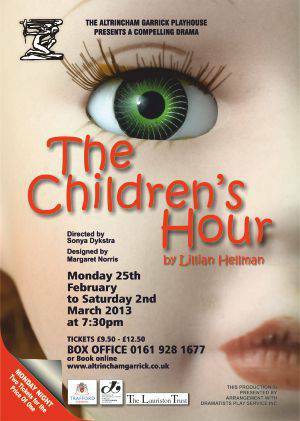 ?The Children's Hour?, the first of Lillian Hellman?s plays has sturdy dramatic strengths though is rarely produced today.?? I?d suspect that Arthur Miller must have learnt from this piece when writing ?The Crucible? as, like that play, it concerns frenzy amongst teenage girls with an unpleasant leader among them who brings catastrophe down on the heads of adults. But witchcraft isn't the charge brought against innocent characters here, but lesbianism, making the play exceptionally daring for the 1930s. Although ?The Children's Hour? enjoyed big success in New York, it was banned from the British stage until as late as 1960. When it premiered on Broadway in 1934, it shocked audiences with its bold and (of that time) shocking subject. It ran for nearly 700 performances and ultimately launched Lillian Hellman's career. Although the subject of this piece has far less impact for a modern theatregoer, given the right Cast and Director, ?The Children's Hour? can still move with its righteous outrage and its powerful accusation of irresponsible actions. As always at the Garrick, this production offered an impeccable set and a collection of costumes which would match those of any professional company.? Leading the cast is Erika Pickard as the vile and scandalous schoolgirl, Mary. Erika?s performance was immaculate, she gave chilling glares and delivered a very intelligent and worthy performance, should Erika desire a career in this craft, she?s certainly got the foundations firmly in place to become an outstanding actress! Making her debut with the Altrincham Garrick company is Lisa Wood as Karen who, in her first scene gave a slightly stringent performance but ultimately warmed up and, when most crucial, delivered some precious moments in the final scenes. Sean Duvall played the school Doctor and fianc?e of Karen with charm and capability though I feel that a character as invariable as this didn?t particularly suit him. Sean was mistakenly making every effort to inject flair, significance and excitement into his character with big gestures and animated reactions when really, just playing him as the straight (pardon the pun), ordinary man that Dr Cardin is, would have given an accurate and intended result for this character. 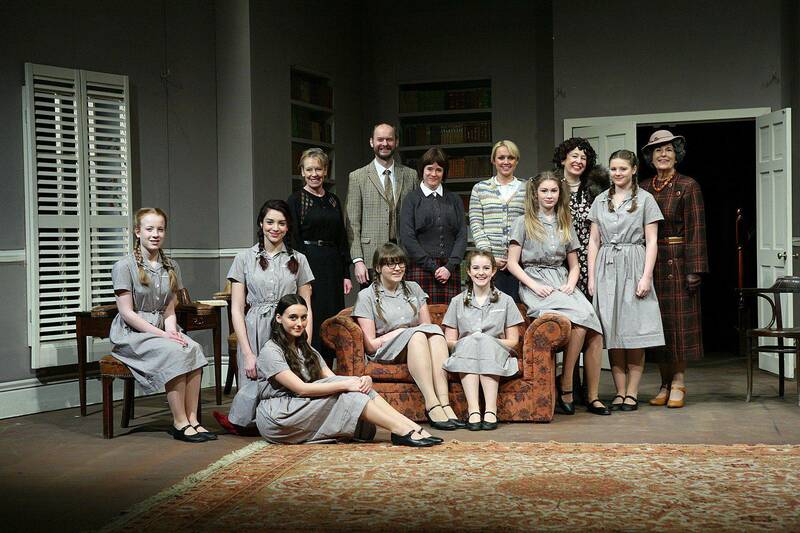 Strong support was given by Grace Garside as Rosalie, Sandra Thomas as Amelia and Jacqueline Wheble as Mrs. Mortar.? 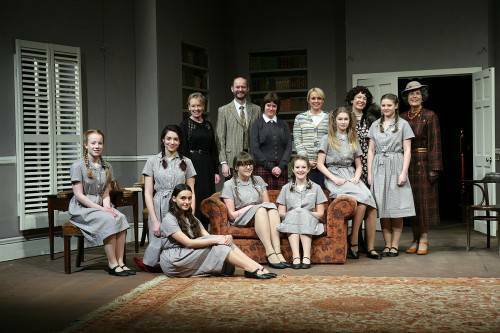 The ensemble of school girls set the scene well, I was surprised we didn?t see more of them due to the level of development in each of the girls characters for such a short time on stage which is highly notable.